I recently had the opportunity to do what’s called a “fireside.” A fireside in the church I’m part of is a casual setting in which you can share spiritual concepts through word – and in my case through music. I like to do a Q&A at the end. I love that it’s spontaneous . Sincere interaction is one of my favorite things in the world. It can be so real and raw – not contrived or over prepared. During these Q&A sessions I often get asked the same question, expressed in slightly different ways. “How do I get my music, or my writing, or my art out there?” Or, “How do I become famous?” While I understand the context and the emotional urgency of this question – I think it decentralizes us and takes us away from what’s truly important. In my experience, fame or being famous is not always directly proportional to positive impact. Think back on the history of your life. Think about those life-changing moments – however large or small – out of which great things have come about. How many of those moments have ever been tied to someone or something famous? That was a moment that changed me and it has stuck with me ever since. It’s a significant moment in my life and it has nothing to do with fame or anyone famous. Of course we all want to have a broader reach. And yes, there may be the potential of more influence with more “fans.” But that doesn’t change the fact that positive impact is not always proportional to fame. The worth of one soul is immeasurable. Every moment you make with someone counts. That means you don’t have to be famous to make a difference. Friends, in today’s Gospel the risen Jesus appears to his eleven disciples. They were understandably terrified and thought they were seeing a ghost. But Jesus is quick to disabuse them of this notion: "Look at my hands and my feet, that it is I myself. Touch me and see, because a ghost does not have flesh and bones as you can see I have." While they were still amazed and incredulous for joy, he stunned them further, saying, "Have you anything here to eat?" With that, they gave him a piece of baked fish, which he ate in their presence. The bodily resurrection of Jesus—as the first fruits of those who have fallen asleep—is the great sign that heaven and earth are coming together. A body that can be touched and that can consume baked fish has found its way into the realm of heaven. What does this mean? It means that bodies are not finally alien to God. We have indeed an Advocate in the heavenly places. Were the Resurrection a convenient story or a clever myth, the two realms of heaven and earth would be as separate as ever. How to Avoid Eating Up Evil! We have seen our fair share of evil in the world. From injustice, infanticide and most recently the attacks of the Catholic and Christian Churches and Hotels in Sri Lanka. Our hearts are broken, knowing that as Christians came to celebrate the Holiest Day of the Year, evil entered into the church by entering into the hearts and minds of Islamic Terrorists, and they killed over 300 people. How do we prevent our hearts from hardening and hating everything about these hateful religious fundamentalists? The answer is: Take a big bite of the Good News of Jesus Christ! I’ll admit, there are many times when I just want to see “this person, that person, or these group of people” just be “eliminated.” I’m not threatening violence on anyone, but sometimes, if we’re being honest, we can get pretty mad to the point where we would “imagine” harm to someone. How do we prevent ourselves from letting those thoughts of destruction take over our rational thoughts? I say, focus on the Good News of Jesus Christ. In other words, I sincerely try and imagine Christ’s presence in our midst. I talk to Jesus and ask him to give me peace. I ask the Lord of Wisdom to grant me a deeper understanding of the situation or that person. It is God who helps us to get our focus back, helps us to remember that Jesus is the one who will bring ultimate justice, and it is Jesus’ example that helps me to gain my senses. I pray that this Easter Season gives you joy and peace, even in a world filled with a smorgasbord of hatred. We all need it and we all want it, money. I guarantee if you use these 4 simple Law of Attraction techniques, you will create more money. You know, money is a neutral energy. You either create struggle with it, or you create affluence with it. Meaning, you feel like it has more power than you, and you’re at odds with it constantly, and there’s never enough, and you’re always worrying about it, and you have a lot of frightful energy and experiences with it, and it has patterns that play out continually, you’re not able to accumulate it, that’s struggle with money. If you’re on the positive side with money and you’re creating affluence, you know that money is always there to support you. It shows up with grace and ease. It’s in abundant supply. You have a lovely, friendly relationship with it. You recognize that it’s a tool in your life. It’s a resource, it’s an art, it’s an energy of exchange. We live at a time when money is mostly experienced through digital form. We’re not paying for most things with dollar bills and cash, we’re using electronic devices actually, more and more. There’s even apps to transfer money. All your bank accounts…you can look at them online, you’re not writing checks anymore, you know, and having to balance your checking account. And your credit, you have a lot of automatic payments. So, the good news is, money is in a state of energy more than a tangible state. When something’s operating more free form as energy you can create what you want with it more freely. So, you’re either going to ramp up creating more debt or creating more affluence with money. Which side of the spectrum are you on? You have an abundance with money. That’s a given. You can either create an abundance of debt or you can create abundance of flow and accumulation. My story, I learned quick, man. It was 1994, we had $45,000 in credit card debt, no income, neither my husband and I had any employment that brought in predictable, steady income. I was starting out my energy healing, coaching, and therapy career. It was very unpredictable at the time, I was one of the first ones to get into that space and build a business around it. And his pattern was playing out very profusely that money was a struggle. He came from that, his family system. 6 areas of life. 16 questions to find out. Take my free stuck quiz and find out what's holding you back from the life you want. When you look at your story with money, how closely does it reflect the same story your parents created? What are the same things you’re still saying about money that you learned in your childhood? I found that money as struggle experience is typically a generational pattern that you have an opportunity to change, that you can actually release yourself from that generational story that’s keeping you captive with money being a struggle, and you can create your own story with money. I had an aha many years ago that money wanted to be my friend. It wanted to support me, it wanted to be my ally, it no longer wanted to be the bad guy. So, around 1994, at the end of the year, I started working on that. I shared with my husband that we were creating what we are experiencing of money. We had a great epiphany one day when he looked at me, we were driving in the car and he said to me, “Do you have any money?” And I said, “No, I never have any money.” And it was like, oh my gosh, I just totally put that…I keep putting that vibration out into the universe. That’s the signal I send over, and over. It’s like this powerful radio wave and what do I keep getting? Not enough money. We drove immediately to the ATM and to cash out and we made a vow with each other that we from that day forward always have cash in our wallet. I have been consistent with that practice for 23 years now. I have a nice wallet. I invested in something that was nicer. Get some cash on your body. Get it in your space. I carry several hundred dollars in cash at any given time. I never go below $100. That’s been the case for 23 years. Now, if you get freaked out to put $100 in your wallet, first, look at your history with this. Do you have cash in your wallet? If you’re afraid to carry cash in your wallet because you think you’re gonna spend it, someone’s gonna steal it, something’s gonna happen, you wanna bring that into your space to clear all that stuff. Get rid of it, it’s not serving you. So, get the energy in your physical space have real, tangible money. Have cash even if you get $25, but make them all single dollar bills, so it’s really thick. Give yourself that experience with money and see what it brings up for you. What fears does it provoke? What issues start coming to the surface? You wanna clean that all up. So, first step, get cash in your wallet, create a physical connection with money. Because it may be very elusive…that money is so elusive to you because it’s so intangible. You just start able to get a connection. This will help you ground the energy of money in your physical space. My second step that will support you is to no longer say, and I made a commitment with myself in 1994 that I was gonna stop saying this and I did it. I have not expressed this since that. When I’m in, I’m full on in and I stopped saying, “I can’t afford it.” I just stopped saying it. And it took me a little longer to stop thinking it, but I stopped verbalizing it because I recognized how potent this phrase was. And that I was setting myself up over and over again to not being able to afford anything I wanted. And you’ll find that when you say it to your children, it’s a real scapegoat that parents use with kids especially at stores, “We can’t afford it. We can’t afford it.” You’re teaching them to be poor. You’re teaching them to not believe in options. You’re teaching them that we don’t have enough money and that’s the reason we cannot purchase it. And in most cases, you could. It’s really not the reason. It’s just a quick out. What you do when you say that? Notice how the energy…where does it go? It closes. It’s like, “I can’t afford it.” You’ve shut off your flow to money. When you say… Let me give you the replacement phrase, because I’m not suggesting you go out and buy a bunch of stuff when you don’t have the financial resources. You know, you wanna make wise purchases with the money you have. You don’t overspend, you don’t wanna create that. So, people get weirded out by this and say, “Well, I can’t say I can’t afford it.” Well, we’re gonna tweak that a little bit. Use this phrase, “I can afford to believe in it. I can afford to believe that the money will show up for me.” What happens when you speak that, think that? It opens. You flow the energy of money to you, “I can believe, I can afford to believe that I can have this experience. It can be a part of my life that money will show up and support me. And I’m excited to see when, and where, and how it does.” Let it show up for you, let it flow. So, remember, no more, “I cannot afford it.” Switch it to, “I can afford to believe in money showing up for me.” Feel that difference? It’s remarkable. I love that, that switch. The third step is clear your energy of being stuck in life of struggle. Well, where do you go to do that? Go to my stuck quiz. See, money is one of the biggest resources we create struggle with. And so, you just overall carry a struggle energy in your system. It’s just a habit. Your condition to struggle with something and so one of the easiest things to create struggle with is money. So, go to caroltuttle.com and you’re gonna see right there on the page you can take my stuck quiz. I’ll take you through my master class to help you clear your stuck energy and you’ll start clearing this energy of struggle. Life is a struggle, I’m struggling with this, I struggle with money. You can let go of that now. So, get rid of the struggle energy, start believing you can live an affluent life. The fourth step, why, you could say this and see what comes up for you. One of my favorite affirmations with money is “I love money and money loves me.” So, just think or speak that right out loud right now, “I love money.” Does that make you feel worldly, sacrilegious, you know, all you care about is money, you’re not a good person, money is more important to you than people? It’s like what comes forward when you say, “I love money”? Do you have a religious tie-in with that, that money is the root of all evil? Money is neutral, money is nothing. It just becomes whatever you project onto it. Money makes you more of whoever you are, as a human being. If you’re a kind, good person, it gives you more options to use your kindness and goodness because it’s a tool to help you make choices, and create stuff, and share it, and do amazing things in the world. So, money is just neutral. It will create whatever energy you give it. So, once I recognized and got rid of all the misunderstandings about money, and I recognized that money was a powerful tool that gave me more choices that allowed me to experience more, to serve more, to support my needs and wants, and to be able to really embrace that phrase, “I love money and money loves me,” to have a loving kind relationship with money, and to see it as a spiritual tool and a beautiful resource in my life, more of it started to show up for me. I appreciated it for that, that resource it is. So, start to say that and, again, you want to provoke whatever stuff you carry that would cause you to shut down. Because when you shut down with money, money shuts down for you. So, four simple steps use them. I knew that if I started practicing this way back in 1994, my life would look dramatically different in 1 year, 5 years, 10 years. Here it is 23 years later. I have completely cleaned up the decades ago, my issues with money. Money shows up in my life. It’s a beautiful resource. I want that for you. So, use these four simple tools to get the law of attraction working for you to help you create more money. Subscribe to my channel here so you can get my weekly heal with “Carol Videos,” and make sure you check out the ones we’ve already published here on YouTube. Thanks for watching everyone. 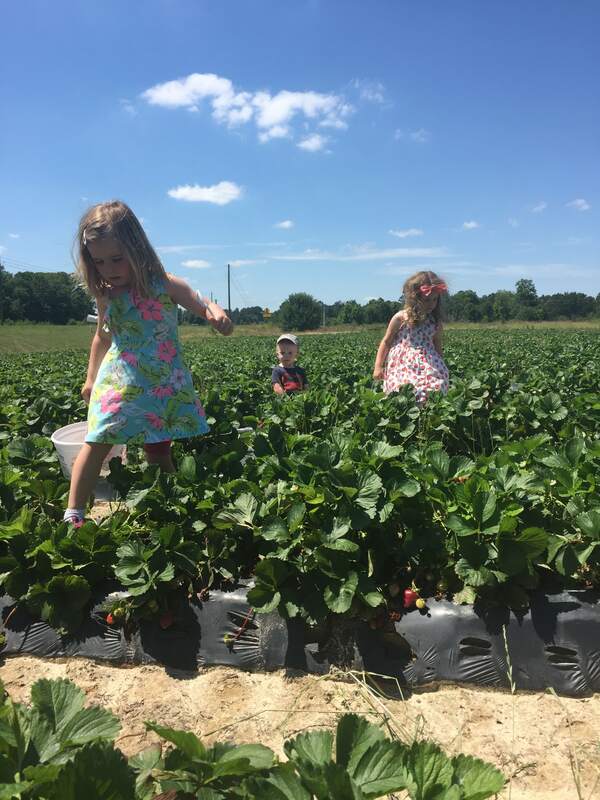 In the busy seasons of parenting, seasonal field trips — like berry picking — can seem like a heavy burden, only truly accessible to stay-at-home parents who do it largely for the photo ops. Plus, who wants to make a long drive to a farm with young kids who are destined to come home sticky, muddy, and over-tired anyway? But motivated mostly by the produce boon, I’ve done almost every kind of u-pick experience with my two kids — from fancy orchards to honor-system blueberry fields. And I’m here to tell you that strawberry picking is the best of the bunch — and yes, it is totally worth your time and effort. Here’s why. Strawberries grow close to the ground, so most u-pick strawberry patches use protective plastic to cover the ground and keep out pests and the space between rows is scattered with straw to regulate ground moisture. All of this makes strawberries easy for little kids to reach but it also makes the whole picking endeavor much tidier. There is little plucking and then dropping your prized berries as there is with blueberries. There are no thorny raspberry vines to contend with. Also, as they turn from off-white to deep red, strawberries make their ripeness pretty obvious — meaning you’re a lot less likely to come home with a bucket full of underripe or tart berries. 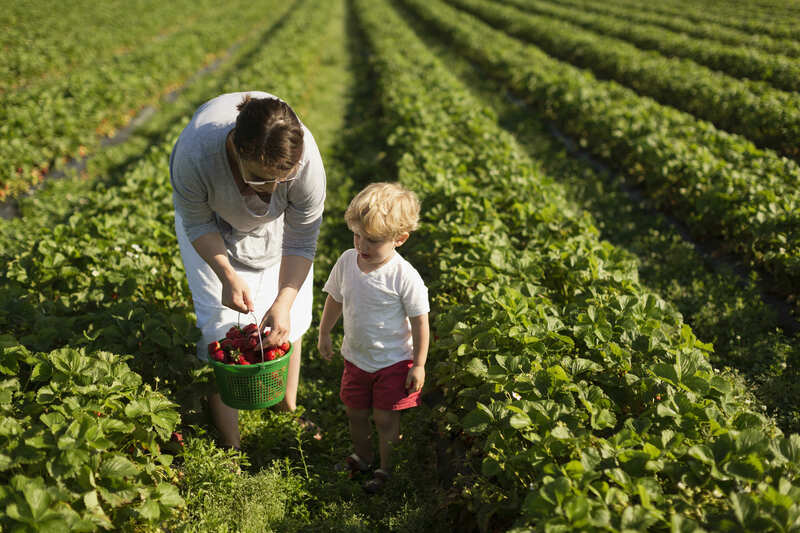 Outside of the obvious berry boon (more on what to do with that later), taking your kids strawberry picking means you get to talk to them about where their food comes from outside of a grocery store. Plus, walking (or trotting) up and down the rows is a guaranteed way to wear them out just in time for naps. As a general guideline, you should do a bit of research before you go about the specific U-pick farms in your area — they can vary widely from commercial farms that sell other produce, honey, and ice cream, to sparse patches that work on an honor system. 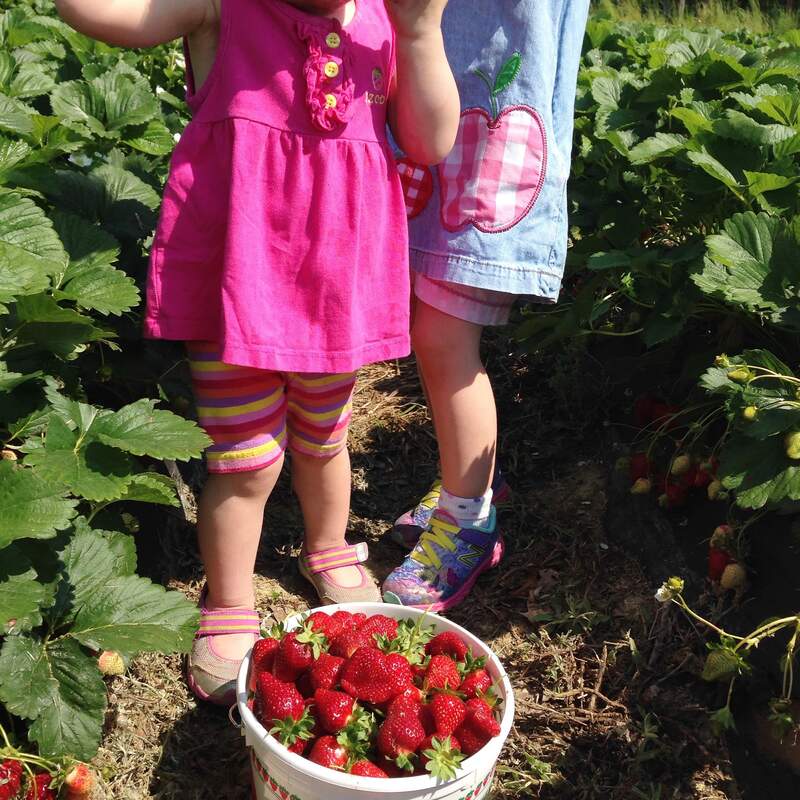 We prefer to go earlier in the day when it’s cooler, as most strawberry fields get full sun. Be sure to pack water and sunscreen, plus snacks. Know the snacking policy before you go. I once had a farmer tell me, “If your kiddos go home hungry, that’s their own fault!” as he encouraged us to eat our fill on the field. Other U-picks have a strict no-snacking policy. If you run into the latter, bring a small container for sampling and pay for them before you get deep into the fields — that way the kids can snack on berries while they pick. Bring your own containers. It is rare to find a U-pick farm that doesn’t charge for boxes or buckets to take home. Most will lend you a bucket for picking, but then you risk mushing berries moving them to a bag or box for the ride home. So bring your own buckets or baskets when possible. Bring cash for berries (and for ice cream!). One of the best features of U-pick farms is their homemade treats like ice cream or hand pies. Don’t miss out on these because you didn’t bring cash. Hopefully, you’ll be coming home from strawberry picking with boxes and buckets of berries. Once you’ve all eaten your fill, you’ll probably still have leftover strawberries longing to be baked or preserved. These are a few of my favorite strawberry recipes that I make with my two kids.